Natures Bounty is the perfect cabin for your getaway! 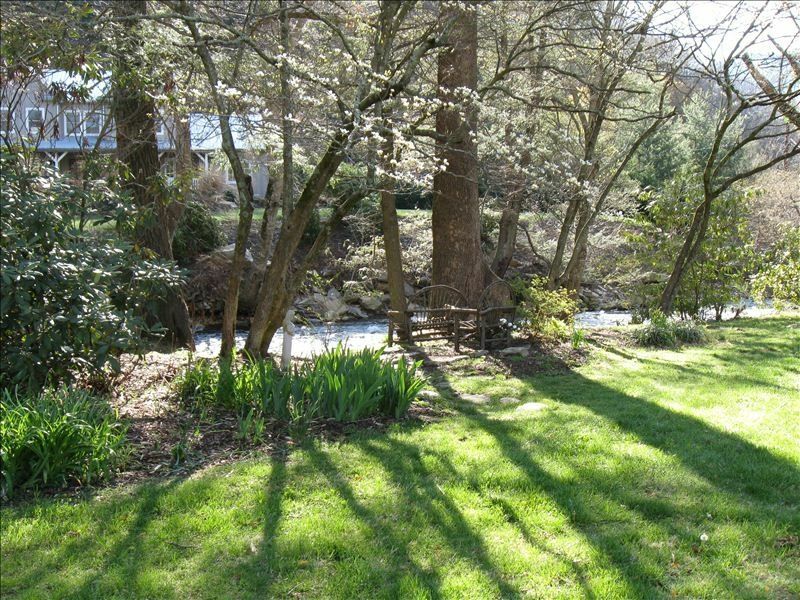 Located in the heart of Maggie Valley yet tucked away on a beautiful private creek with a very easy in and out drive, even when bad winter weather arrives. The Valley is walking distance so restaurants and pubs are only a few footsteps away. Cataloochee Ski Area is only minutes away for a great day of winter skiing and snowboarding. After a day out come back to Natures Bounty and relax by the creek or get in the hot tub on the large screened in porch. The house is clean and very nicely decorated and equipped with hi-speed wireless internet. Towels and linens are provided. My wife Karen and I just celebrated 28 years of marriage. We live in Cashiers North Carolina on Lake Glenville. I am a chimney sweep and own Cashiers Chimney Professionals. We have been in business here for 30 years. We were not looking for a rentail property, but our friend Paul Heathman with Dream Reality show us the property and we saw the potentail and feel in love with it. Ofcourse we did a lot of work to the house, new kitchen, added the deck and hot tub, removed the carpit and finnished the hardwood floors. Painted inside and out. This year we totally renovated the 2 downstairs bathrooms and added a 1/2 bath to the upstairs loft. FUN! A couple of unique benefits that stand out. The rushing creek is awesome. It is a stocked creek with trout. The large deck overlooking the creek with the hot tub. Being able to walk to the town of Maggie is nice. Being close to Cattaloochee is a bonus, and the easy drive in and out is also nice. Enjoy this private Hot Tub on the screened in porch! This is a great property located in the middle of Maggie Valley and close to everything - skiing and restaurants. My 3 sons and I enjoyed this cabin for a long weekend of skiing and it was perfect. The sleeping situation was ideal for the 4 of us and the beds were all very comfortable. The kitchen and living room area were great for us to hangout and relax after a long day. The hot tub on the screened in porch, with a view of the river flowing behind us, was a great way to relax after skiing. The cabin is well kept, was clean, offered plenty of towels and the kitchen had everything you need if you wanted to cook in . Again, location is ideal and the owners were great. They were out of the country when we stayed but immediately responded via text to a voice mail I left them with a question. Simply a great property. The house was nice but next time we need king size beds! Enjoyed every bit of the house and property. Very surprised it had the necessities, (ex. Paper towels, toilet paper) so that was a plus. House was very clean and decor was so stinking cute. A very homely feel to the house. Hot tub was just what we needed after a night of tubing at tube world. Stores and fun right around the corner which was so convenient. Thank you for allow us to have our first family vacation an amazing experience. We will be back!! The house was centrally located near the attractions but tucked away so you could enjoy some quiet time while enjoying the beautiful home. The sound of the stream & the fireplace to warm by just was icing on the cake. Hope to visit again soon . Great property right in the heart of Maggie Valley but still has the feeling of a secluded cabin in the mountains. Would definitely stay here again if the opportunity arises. I came to Maggie Valley for a wedding and stayed at Nature's Bounty for a week. I loved hearing the river rushing by, the screened porch, hot tub, the location and the comfort of this home. I would most definitely stay here again. Thank you for sharing your beautiful home with me! !